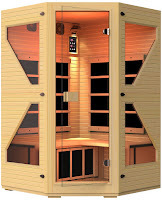 The JNH Lifestyles NE4CHB1 ENSI 2 to 3 Person Corner NO EMF Infrared Sauna is constructed from 100% Canadian Hemlock wood (no chemicals, no plywood or MDF!) and utilizes the latest technology with 5 ZERO EMF carbon fiber FAR Infrared heaters. 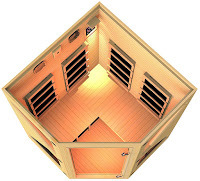 The Zero EMF heaters used in the JNH Lifestyles NE4CHB1 Sauna are the only NO EMF heaters tested and certified by Intertek and approved by ETL (Edison’s Testing Laboratories). The 5 commercial-grade carbon fiber FAR infrared heaters are optimally placed for maximum performance, with 4 rear (2 on each of the back walls) and 1 at calf level. The JNH Lifestyles NE4CHB1 ENSI Sauna is made with double-layer 100% Canadian Hemlock T&G (Tongue & Groove) solid timber (FSC certified) for stronger structure and better heat insulation. This innovative construction means you can fit the sauna into a tight corner without having to worry about heat expansion or insulation. 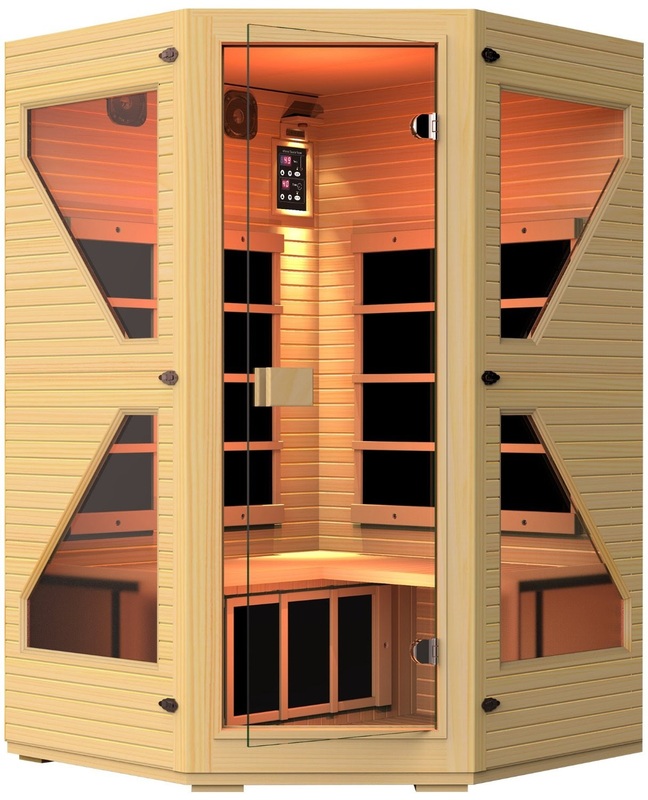 The JNH Lifestyles NE4CHB1 ENSI 2 to 3 Person Corner Infrared Sauna is easy to construct with a unique “tools-free” design that allows you to simply buckle the panels together. The advantage of the buckle panel design also means it’s easy to take down if you wish to relocate it! The inside of the JNH Lifestyles NE4CHB1 ENSI Sauna appears light and spacious so you don’t feel boxed in, thanks to its see-through glass door and side panels along with its LED lighting. The door/side panels are made from special safety glass which is designed to withstand high temperatures from within the sauna, providing better heat insulation. The interior LED lighting is long-lasting and is 50% more cost-efficient than standard light bulbs. You can control the temperature (up to 140 degrees) and duration of your sauna with the JNH Lifestyles NE4CHB1’s easy-to-use digital control panel. This sauna is even equipped with a sound system comprising of 2 premium speakers with an amplifier via a 3.5mm auxiliary plug, including a volume rocker and on/off switch. The sound system is compatible with all portable audio devices so you can listen to your favorite music as you relax and reap the many health benefits of a home sauna, including detoxifying the body, improved skin tone, increased circulation, relief from aches/pains, and boosted immune system.